On Monday the next phase of neutrino physics at Fermilab fell (gently) into place. The MicroBooNE detector — a 30-ton, 40-foot-long cylindrical metal tank designed to detect ghostly particles called neutrinos — was carefully transported by truck across the U.S. Department of Energy's Fermilab site, from the warehouse building it was constructed in to the experimental hall three miles away. The massive detector was then hoisted up with a crane, lowered through the open roof of the building and placed into its permanent home, directly in the path of Fermilab's beam of neutrinos. 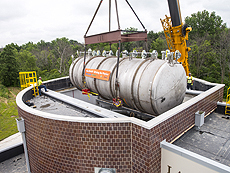 There it will become the centerpiece of the MicroBooNE experiment, which will study those elusive particles to crack several big mysteries of the universe. 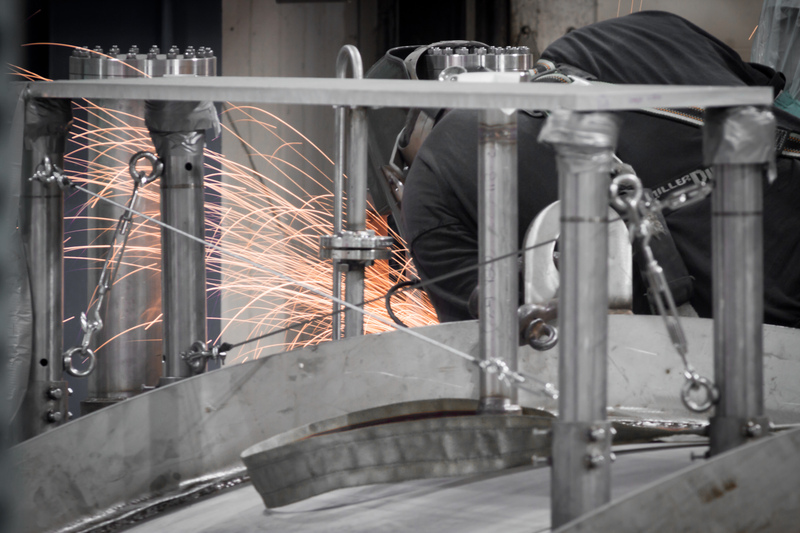 The MicroBooNE detector has been under construction for nearly two years. The tank contains a 32-foot-long time projection chamber, the largest ever built in the United States, equipped with 8,256 delicate gilded wires, which took the MicroBooNE team two months to attach by hand. This machine will allow scientists to further study the properties of neutrinos, particles that may hold the key to understanding many unexplained mysteries of the universe. "This is a huge day for the MicroBooNE experiment," said Fermilab's Regina Rameika, project manager for the MicroBooNE experiment. "We've worked hard to create the best scientific instrument that we can. To see it moved into place was a thrill for the entire team." 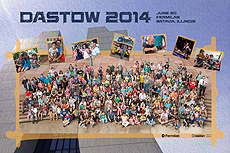 DASTOW souvenir posters are now available for pick-up in the Wilson Hall atrium by the reception desk. The House Appropriations Committee has approved an FY 2015 Energy and Water Development Appropriations Bill. The $34 billion bill provides funding for the Department of Energy, including the Office of Science and the National Nuclear Security Administration. During yesterday's markup session a few amendments were considered to the bill developed by Energy and Water Development Appropriations Subcommittee; none affected funding levels for the Office of Science. The BICEP2 team's detection of polarization features in the cosmic microwave background, reported in Physical Review Letters, represents a fundamentally new piece of evidence for inflation, which has been a staple of cosmological theorizing for decades (see 19 June 2014 Viewpoint). Despite some concerns among experts about whether the polarization is truly of cosmological origin, theorists have been considering the next steps. In several other reports in PRL, theorists explain how further observations can test whether BICEP2's reported polarization truly represents a lingering trace of inflation. Their analyses also discuss how such observations can probe differences among the various inflationary scenarios that cosmologists have devised. We will need to build many new partnerships — and strengthen many existing ones — over the coming years as we strive to turn the P5 vision for our country and our lab into reality. But our relationship with Department of Energy will continue to be most important for future success. 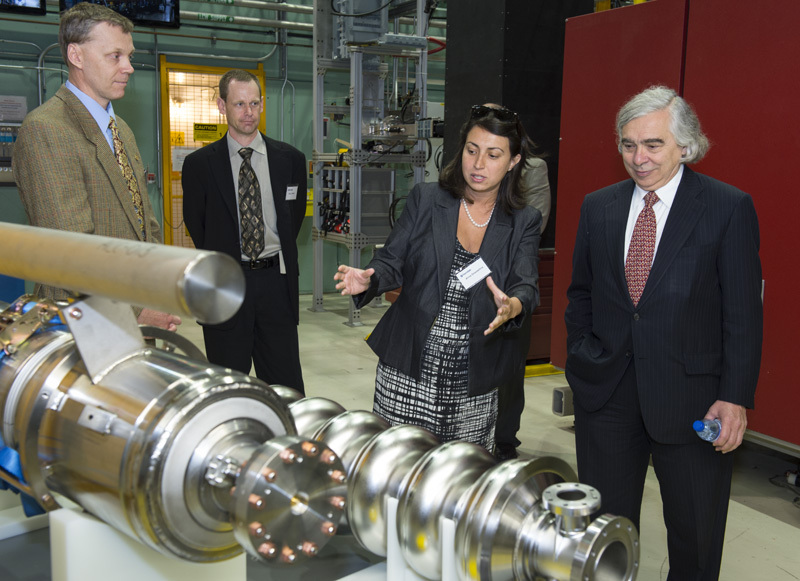 A visit by Energy Secretary Ernest Moniz to the Chicago area last week provided us with an opportunity to enhance the strength of this key partnership. On Thursday I spoke at a meeting of the Secretary of Energy Advisory Board held at Argonne National Laboratory. SEAB, as it's known, is a distinguished group that provides advice and recommendations to the Secretary on all of the department's activities. The board, co-chaired this year by former SLAC Director Persis Drell and former Undersecretary of Energy John Deutsch, does not often have the chance to learn about or weigh in on DOE's particle physics mission. So I appreciated the opportunity to lay out the global context for our field, explain the excitement and promise of neutrino physics and discuss the challenges ahead to achieving the P5 plan. 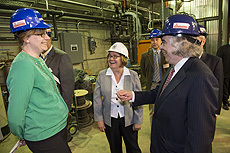 On Friday it was our lab's turn to host Secretary Moniz. We had a short period of time to show off our lab's excellent scientific and technical infrastructure, the expertise of our staff and our users, and our plans for the future. In just under two hours the Secretary heard about our SRF capabilities at NML; viewed the new IARC building; learned about our forefront neutrino program through a visit to the Minos cavern; discussed the LHC, CMS, dark energy and dark matter with our young scientists; and even experienced our cultural activities through a stop at the Tufte exhibit on the second floor of Wilson Hall. His visit concluded with a presentation to more than 700 staff members in Ramsey Auditorium (with even more watching in the One West overflow room). Thanks very much to all of you who turned out on a Friday lunch hour to hear Secretary Moniz present his views on the future of science, energy and innovation in the United States. As the Secretary highlighted in his remarks, our country faces challenges in many areas and at many levels, including climate change, exascale computing and internationalizing our neutrino program. The Secretary also made clear his commitment to engaging with all 17 national labs as strategic partners to meet these challenges. We look forward to working closely with DOE to do our part to push the frontiers of science and innovation. Styrofoam cups used in U.S. In Monday's Tip of the Week, we incorrectly stated that every year, 25 million Styrofoam cups are thrown away in the United States. The more accurate number is 25 billion. The issue is now corrected. Fermilab Today regrets the error.